MagnaTiles Solid Colors 2300 - Valtech Co. 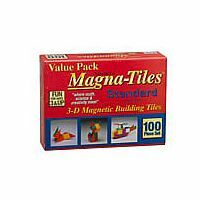 These tactile, colorful tiles are sized just right and easy to use, whether creating designs on a flat surface or building in 3-D. Basic shapes are learned through play. Develops patterning, shape recognition, building and motor skills. Can be used for guided activities or hours of open-ended fun and exploration.